Hello hello hello! Another week has gone by and another Friday is upon us! How excited are you for the spring? I actually don't like spring because I associate it with allergies, but fingers crossed for this season, I am prepared and ready for it! So this is a long overdue accessory organizing update. I have been trying to come up with some better ways to organize accessories and makeup (especially inside of a makeup cube, that's coming in another post). So today, let's talk about how to organize sunglasses and headbands. Naturally, as an accessory lover, I love sunglasses and any hair related accessory. Over the years, I have collected some nice ones and lately I have been struggling with my growing collection of sunglasses. I went through them and donated the ones that I no longer wear and organized the ones that I wanted to keep. Now let's get into headbands! For as long as I can remember, I have worn headbands - the bigger the bow, the better. Over time though, they can get weak and stretch out, therefore I suggest that before you purchase an organizer, you go through a purging process of all the ones that are stretched out, broken or have missing rhinestones/beads. Once you've done that, you can then determine the best organizer for your collection. Check out my pics and tips below and as always, feel free to follow, like and repost! If you aren't following me on bloglovin, Instagram, Facebook or Pinterest, hit those buttons to the right - I promise not to spam you! Also, stay tuned for next week's post, I'll give you a hint - it's all about travel and you won't wanna miss it so make sure you follow along! Here is my acrylic solution for sunglasses. I first came across these drawers on Amazon and purchased one. It's pretty deceiving, but these are 4 different units! 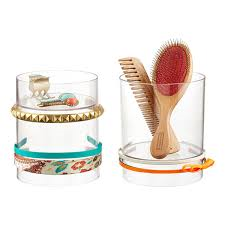 Each piece stacks on top of the other, so you can buy as many as you like to accommodate your collection. Each drawer holds 6 pairs of sunglasses. Here is a different configuration of the drawers. Instead of stacking all 4 on top of each other, I stacked them by 2 side by side. Depending on the space that you put them in, you can play around with the set up. What I love is that they each have a tray on the top for stacking other items. One thing to note, not all glasses will fit inside the drawers. If you have really large sunnies, they may be too big to fit, so depending on your collection, this may not be the best organizer for you. A lot of aviator glasses and cat eye glasses fit nicely. Here is what a single unit looks like and you can find it on Amazon here. They also come in a bundle of 2, which is cheaper than buying them 1 by 1 if you think you need multiple units. Now on to headbands! Like I mentioned above, I love headbands and have worn them for many years. I've been noticing how popular they are again, which prompted me to sort through the ones I had, toss the ones I didn't want anymore (or that were damaged) and add a few new ones to my collection. Previously, I had them stored in a decorative box (check out my previous storage here - I absolutely loved these boxes, but have since grown out of the style). I like that you can store them around the body of the organizer or put them inside the organizer. Here is what the organizers look like without all the headbands wrapped around. You can find them here. I picked up 2 because I knew I had quite a few headbands to store. What I love about these organizers is that they have hollow inside compartments where you can store whatever you'd like! I have stretchy bands and thin headscarves in mine. 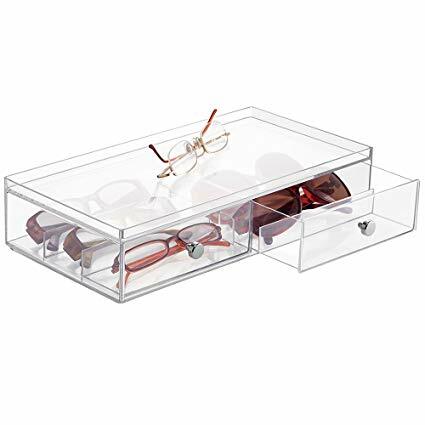 As I mentioned above, what's cool about the sunglass organizers is that there is a tray where you can place other items if you want. I placed the two headband organizers there and they fit perfectly. One tip that may be obvious, is that you should measure prior to purchasing organizers and then compare your space to the dimension of the organizer. This will prevent having to return and reorder! Another tip, if you have a lot of cloth headbands like the ones I have on the left, one way to stop them from sliding off the bottom of the organizer is to place a bobby pin over the headband and plastic so that they don't slip.